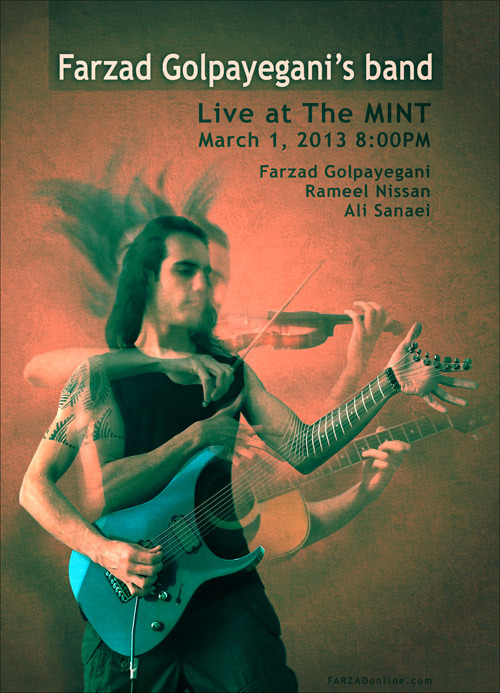 Farzad Golpayegani’s band performs at “the Mint” in Los Angeles, CA on March 1st 2013. This is a one-night only concert before Farzad and his band play live at the 2013 South by Southwest (SXSW) festival in Austin TX. Get tickets online at the Mint’s website or Levantine Cultural Center’s website. The concert at the Mint will feature eastern tunes on electric and acoustic guitars and bass, violin, and a mix of Persian and classical music with metal. The vibe is progressive feel-good rock. This is one in a new monthly series of Middle East rock/jazz/fusion concerts presented by the Levantine Cultural Center and the Mint—the Middle East Rocks. An art exhibit of Farzad Golpayegani’s work and after party take place next door at the Levantine Cultural Center, 9:30-11:30 pm, 5998 W. Pico Blvd., Los Angeles CA 90035. For event on facebook please click here.